219-484-2055 to enjoy our auto shipping services. Consider us as your one-stop shop for all your auto shipping needs in the city. For the last 6 years, we have worked with thousands of satisfied customers that requested different kinds of car shipping services. We work on all kinds of shipping requirements for business, professional or personal needs. Nationwide Auto Transportation is in the business to provide enclosed vehicle shipping, open shipping and even flatbed vehicle shipping. Our business offers flatbed shipping for large-sized vehicles including a number of heavy equipment units. If you need to ship large SUVs or cargo vans, then our team will recommend flatbed shipping. We customize the service for you so that the right auto shipping service will be delivered every time. Make your move count; call us at 219-484-2055 to start working with a reliable auto mover that understands your needs. We are not your ordinary auto shippers; our business is bonded for $75k and covered with a liability insurance of up to $1 million. We are ready to take on any shipping task and we will provide the service in the most efficient and secure way possible. 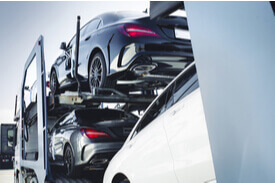 We invite you to take a good look at our collection of auto shipping services- from flatbed to low boy carrier shipping. We deliver auto shipping services for all kinds of businesses, so call us at 219-484-2055 to sign up and provide solutions to your shipping requirements!